Will May Day Protests Rejuvenate the Occupy Movement? From April 9-15, thousands of Occupy activists got direct action training in preparation for the “99% Spring.” The goal is recapturing Occupy’s momentum, with a greater focus on targeting specific corporate wrongdoing. But getting large turnouts may not be easy. On April 24, expected massive protests at San Francisco’s Wells Fargo shareholder meeting drew only roughly 1,000 people. The upcoming May 1st protests becomes the first nationwide test of Occupy’s current strength and growth potential. Large turnouts would confirm Occupy’s rejuvenation, reaffirming the movement’s success in defining the nation’s problems. Such turnouts could also help Occupy’s efforts to broaden its base, essential for a movement whose growth requires more than mobilizing existing activists. Last fall, there was so much excitement about the seemingly overnight emergence of the Occupy Movement that activists could not wait to jump aboard. But sustaining large turnouts and effective events has proved challenging. This is particularly the case when the target – income inequality – is more amorphous than getting thousands to go to Seattle on a specific date to shut down a meeting of the WTO. If this were Spain, getting large turnouts for May Day protests would be easy – May 1st is a national holiday. But although May Day emerged from police attacks on striking workers in Haymarket Square in Chicago in 1886, the United States has no May Day holiday (President Eisenhower announced it as “Loyalty Day” and President Reagan actually declared May 1 as “Law Day.”). 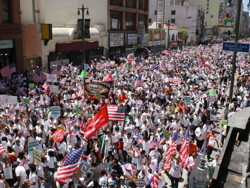 The massive Spring 2006 immigrant rights marches were made possible by employers giving workers the day off to attend, and by church and labor groups making an all out push among their members. This is unlikely to be replicated at the May Day 2012 events. What made Occupy’s emergence so inspiring was that it brought new people into a movement for social change. Stories abounded of previously apolitical people suddenly getting involved in Occupy’s grassroots protests, and even the traditional media accepted that rising inequality and the nation’s economic crisis had broadened calls for change beyond the usual suspects. But as time passed, Occupy’s activist base narrowed. The movement splintered over issues of property destruction and camping in public places, and many involved recognized that after the intensity of the fall protests there was time needed for rethinking and strategizing about Occupy’s direction. This gave rise to the 99% Spring direct action trainings, and to groups like MoveOn playing a larger role in promoting and mobilizing Occupy protests. Some Occupiers are not happy about the involvement of organized/hierarchal groups with major resources, fearing the “co-optation” of the movement. But this feeling appears to be in the minority. And anyone who thinks mass movements can be built without churches, labor unions, and other organized constituencies playing a key role does not know U.S. history. My chief concern about Occupy’s future is that I do not see enough resources devoted to organizing new people to get involved. In the months before the WTO meeting in Seattle in 1999, anti-globalization groups went everywhere to recruit people to protest the event. This organizing was off the media’s and political class’s radar screen, so the massive and historic “Battle in Seattle” that followed came as a shock to both. But the huge outpouring was not a surprise to those on the ground that had seen those intensive organizing and outreach efforts. Contrary to what many still believe, the Seattle WTO protests were not a “spontaneous” uprising. And because last fall’s Occupy protests began as such, some may believe that the “Field of Dreams” outreach approach can still work – i.e., announce events and the people will come. But even if some people spontaneously decide to join protests on May 1st, this approach is not sustainable. Many activists burn out after attending a few powerful protests, and others drop out if they do not feel results are obtained by their direct action participation. That’s why it is so critical that groups seeking to grow the Occupy movement go beyond mobilizing their existing base. The existing activist base is not large enough to fulfill Occupy’s sweeping goals, or even powerful enough at this point to win long-sought changes in foreclosure practices. In Seattle in 1999, activists had to shut down a single meeting. After accomplishing this, they could go back to their daily lives. Occupy’s goals cannot be accomplished by closing down a particular meeting, by passing a single piece of federal legislation, or by re-electing of President Obama. Its ambitions require a more sustained activist commitment, which can only be achieved by the type of intensive outreach efforts too often now only used by progressive activists during election campaigns. I hope massive crowds sweep the nation at the May Day 2012 events. But the real test of their success will be the numbers of new people whose contact information is taken down, and who become committed to future Occupy activism. Randy Shaw is author of The Activist’s Handbook.